VISUAL BASIC AND DATABASES ​(Table of Contents) is a tutorial that provides a detailed introduction to using Visual Basic for accessing and maintaining databases for desktop applications. Topics covered include: database structure, database design, Visual Basic project building, ADO .NET data objects (connection, data adapter, command, data table), data bound controls, proper interface design, structured query language (SQL), creating databases using Access, SQL Server and ADOX, and database reports. Actual projects developed include a books tracking system, a sales invoicing program, a home inventory system and a daily weather monitor (Project Screenshots). VISUAL BASIC AND DATABASES is presented using a combination of over 850 pages of self-study notes and actual Visual Basic examples. No previous experience working with databases is presumed. It is assumed, however, that users of the product are familiar with the Visual Basic environment and the steps involved in building a Visual Basic application (such training can be gained from our LEARN VISUAL BASIC ​course). VISUAL BASIC AND DATABASES requires a Microsoft Windows operating system, Microsoft Word, and the free Community Edition of Microsoft Visual Studio 2015. The Visual Basic source code, databases and all needed multimedia files are available for download after purchase. The latest Errata for the 2015 Edition can be found here. This tutorial is available in a PDF, Mobi, ePub and Word E-Book format. The entire E-Book and/or selected chapters can be printed on your local printer and/or viewed on your computer screen. The E-Books can be downloaded from our website immediately after purchase . We compress all these files using a .zip format to help reduce the size for faster downloading. If you are a full time school teacher, we also sell this E-Book Tutorial in an Annual Unlimited User Site License Teacher Edition. Our Teacher Edition allows you to distribute the tutorial and source code to any of the students who attend your computer science class. You can customize and personalize the tutorial and the associated source code to fit your unique teaching style whether the class is self study or instructor led. Since this Tutorial is distributed in an editable Microsoft Word format you can add your own teaching text and/or notes around our teaching text. You can add your own diagrams and/or personalize the E-Book tutorial to fit your specific teaching needs. Unlike other Tutorials that are only Paper or PDF based, you can modify our teaching narrative and source code inside the tutorial and reprint as needed. This unique flexibility sets us apart from all other tutorials on the market. We also sell special large scale multi-teacher site license agreements for School Districts and Online Schools. Please contact us directly if you are interested in a large scale license agreement via the Contact Us tab above. These special large scale licenses are not sold via this webpage. Click on any of the “Add to Cart” options on the left of this page to select your preferred delivery option. “Most computer programs in use today require some interaction with information stored in a database so learning to program with databases increases the marketability of a developer exponentially. This book is structured as a self-study guide but it is easily adapted to classroom lectures and discussion. The content of the book is excellent. It starts with the basics and graduates in small and clear but functional increments. It makes database programming much easier to teach and learn. “Visual Basic and Databases” provides a complete, thorough, and easy to understand explanation of database program development from two people who came up through the ranks as software developers. Their examples reflect real-world applications that will help new developers quickly master database software development. Students can easily convert and expand the examples for their own applications. For example, the Books Database in Chapter 4 could easily be modified to search a similar database of cars, bikes, or passwords, etc. Examples are created using Microsoft’s Access database management system (DBMS) and SQL Server. This makes it easy for the student to compare their capabilities and syntax. 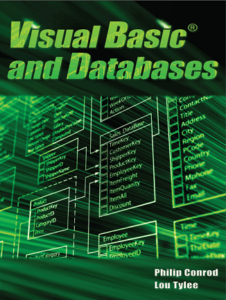 I have sincerely enjoyed reading and working through the examples in, “Visual Basic and Databases”. The examples are clear and easy to follow. If I had any questions or if my code did not work I could simply peek at the authors’ completed code examples to get back on track. Throughout the book the authors bring attention to the importance of user interface (UI) design. This is more important than may be obvious at first but developers tend to focus on the code and forget about the UI but eventually someone needs to use this program so a functional and attractive presentation of the program can be the difference between success and failure of the end product. A major plus for this text is how the authors include additional and very useful parallel topics such as the On-Line Help system created in HTML in Chapter 5 and the Graphics Methods in Chapter 7. The book is not about HTML or graphics but the coincidental inclusion give the student a valuable glimpse at other topics of importance. These are just two examples that didn’t have to be included but they are added as part of other chapters and will ultimately benefit the student. This took a lot of forethought by the authors and demonstrates the real value of the book. JR, La Grange Park, Illinois. AR, New York, New York.